I drive intercity trains for a living. The new timetable is not faster but express trains have fewer stops which gives the illusion of a faster service. The only solution to network congestion is to double the average network speed. At the moment its around 20km/h. Very slow even by Australian standards. If a small amount of money is spent this is achievable, Sydney’s network speeds have slowly been reduced to the point that steam trains in the early 1900’s traveled the same track at a faster speed and in less time (back when the sleepers were wooden and the rail of a lighter gauge). By straightening platforms, upgrading turnouts to a higher speed, fixing signalling, and better maintenance of the rail line the network average speed would be more than double what it is today. Surprise surprise at double the speed you can double the network capacity and all this with the same amount of trains. Trains could go from say Waterfall to Bondi Junction and back to Waterfall in the time it now takes to go from Waterfall to Bondi Junction (the distance from Waterfall to Bondi Junction is around 45km and it takes over an hour to get to Central from Waterfall). It would take less money to this than to go and buy another 50 new trains which i’m sure the short sighted State Government will go and do to increase capacity. That would reduce stress on the fleet, but it wouldn’t reduce constraints on the infrastructure, particularly at Town Hall platform 3 & Central platform 16 in the AM. True the city network needs some major work and some large amounts of money spent on it. My idea would reduce congestion but not solve the long term problem. I work on the Illawarra and South Coast lines only so the solution would work on these lines as they are separate to the rest of the network. But I must stress that fixing the bottlenecks and major upgrades won’t work if the norm of reducing network speeds continues. Additional Northern Line services are more likely to start from Epping. Although it would be feasible to start from Rhodes from the relief line platform, which is currently free of freight train movements in peak hours, there would also be the need to provide extra services for Eastwood and West Ryde, two of the busiest stations on the Northern Line, as well as the increasing demand from Meadowbank. There would also be a problem for trains terminating and starting from Rhodes when the current Northern Sydney Freight Corridor works are completed, which will allow for 24 hour freight train movements. Can additional services be added from Epping to Starthfield, given that there is only one track pair for most of that corridor and the existing services are a mixture of express and all stops? I’m not sure that’s possible at the moment. And if you could, then you would probably need a very fast turnaround time at Epping, faster than I think is practical. You could also start them at Eastwood #2, so long as that crossover is still there. Yes, you could. The crossover is still there and in fact it is often used to turn around Western Line trains from Strathfield during trackwork on weekends. The terminating road is actually the Down Main (Platform 3) which crosses over to the Up Main when returning towards the city. In response to Bambul, it should be possible to add at least 2 additional services from Epping to Strathfield. There are currently 4 all stations services from Epping and 4 Intercity services in the peak. All of the Intercity services stop at Epping and Eastwood, with 1 service also stopping at West Ryde. There are 4 tracks between Epping and West Ryde, which allows for express trains to overtake all stations services. There are only 2 tracks from West Ryde to Strathfield ( excluding the relief line from Rhodes to North Strathfield used mainly for freight trains) which should be able to cope with 10 trains per hour. Here’s the problem. 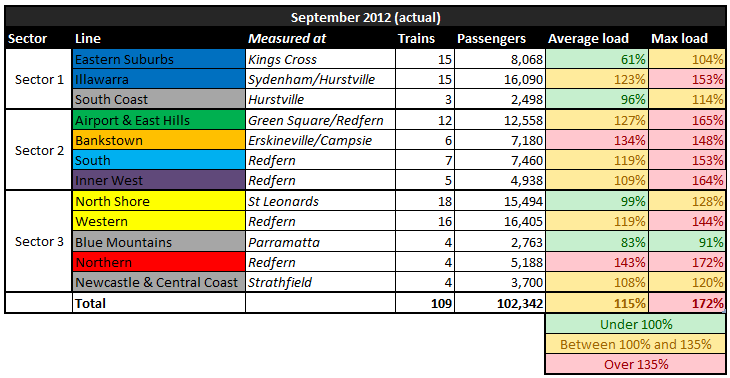 It takes 22 minutes for an all stops train from Epping to Strathfield. It’s 14 minutes for an express train from Epping (stopping at Eastwood) to Strathfield. Say an express leaves Epping at 7:00 and 7:15, arriving at Strathfield at 7:14 and 7:29. An all stops train can arrive at Strathfield at 7:26 or earlier (given 3 minute headways). If it arrives at 7:26, then it must leave Epping at 7:04. Any additional service must leave Epping at 7:01, to allow the 7:04 service to leave on time. But then there isn’t enough overtaking track for the 7:00 express service to build up enough of a headway so as not to delay the all stops train. That’s why adding a new train from Rhodes is much easier. Plus it provides relief to the lower Northern Line stations which most need the relief. Oops, yes I did get my platforms mixed up at Eastwood. Can you fix the sectors in the OP? It seems that what actually happens is that two extra trains come out of the yard at Hornsby, run out of service to Epping #1 and start there, missing Burwood, Nth Strathfield and Denistone, then run to Central(i) at a similar time to the normal train. Perhaps these will be 4 car units because I can’t imagine a huge incentive to use these trains even if they are slightly faster. As I said, the additional 2 services on the Northern Line via Strathfield are more likely to start from Epping rather than Rhodes and this has been confirmed in the leaked draft timetable. This has been achieved by operating the new services as semi-express, skipping Denistone, Concord West North Strathfield and Burwood and proceeding via the Main Line tracks from Strathfield to terminate at Central, just keeping ahead of the following Intercity service. The 7 minute headway from Epping for the following Intercity express service reduces to 2 minutes by the time both services reach Sydney Terminal. In fact there could potentially be another 2 services added in the peak hour period if the same operating pattern was followed. However, there is no further capacity beyond this until the missing links between West Ryde and Rhodes to complete the quad between Epping and Strathfield are implemented as part of the next stage of the Northern Sydney Freight Corridor program. Indeed, you were right! Well guessed. It also appears that the 2 new services are 4 car sets (due to there being lower demand for Central only services), so capacity could be increased by changing these to 8 car sets. Given that these 2 services arrive during the busiest time in the morning peak, that would probably be a better option than adding a 3rd or 4th service. Western Sydney Express Trains – I was looking at the New TimeTable and it looks like nothing improved for the Western Timetable. Western Area again overlooked! !